In case the patient has to be washed directly on his bed, either at home or in an institution, the CSO Shower set and small basin for washing the hair will be found handy. The basic part of the shower set is the inflatable tub. The flat tub will be spread under the patient lying on the bed and inflated simply by using the pedal - operated pump. In this way there is produced a sufficiently large and firmly surrounded area that can be used for giving a shower to the patient. Then the water has to be drained through an outlet hose into a vessel prepared on the floor. 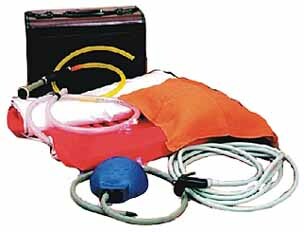 The components of the whole set as follows: a pillow to be put under the patient´s head, small manual shower for rinsing with water from the small tub and a shower hose 10 m long with a shower rose including the STOP valve. The flat tub and all accessories are delivered in a plastic pilot suitcase that makes it possible to store the set easily before use.